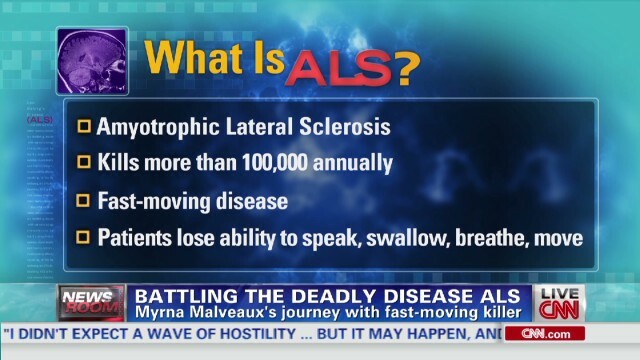 CNN’s Suzanne Malveaux shares her family’s personal journey with ALS. Suzanne’s mother Myrna Malveaux was diagnosed with the disease a year and a half ago. Thursday, July 25th for Malveaux visits with former New Orleans Saint Steve Gleason and his family and witnessed the “tricked” out technology of Gleason’s $25 million dollar high-tech facility built for ALS patients. Friday, July 26th Malveaux followed Augie Nieto. Nieto is the founder of Life Fitness Gym and was diagnosed with ALS eight years ago. Nieto launched his foundation “Augie’s Quest” raising $37 million dollars to find a cure for the disease. This will be the conclusion of the series.